A toilet waste holding tank alert system that warns you when the toilet holding tank is nearly full by activating a red warning light. 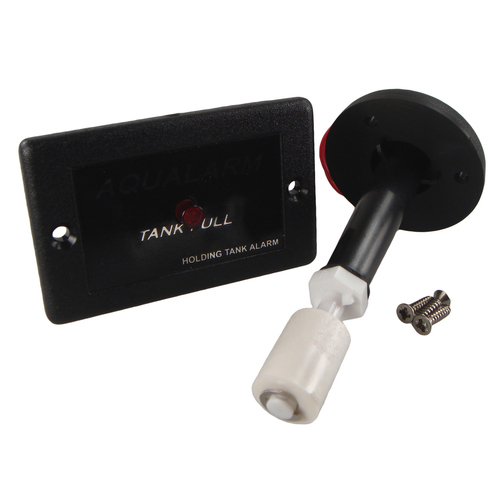 The AquAlarm Toilet Waste Monitor is a highly reliable warning system for toilet holding tanks. It is designed to alert users when the holding tank is nearly full and in need of a pump out. The early warning system helps prevent tank overfill and possible toilet system failure. The micro float switch which is installed directly into the top of a waste holding tank activates a bright red warning light on the instrument panel when the tank level reaches the full mark. When the red light is activated it means a pump out is required as soon as possible. With this boat toilet tank monitor there is no electrical components that contact water and there are no additional probes that need cleaning. The tank monitor can be installed to any tank material, including metal and plastic, and can operate on either 12 volt or 24 volt DC.